Preheat oven to 350°. Coat a small baking dish with cooking spray. Remove shrimp tails. Dice shrimp into small pieces. In a medium bowl, combine shrimp, goat cheese, lemon juice, bread crumbs, salt and pepper. 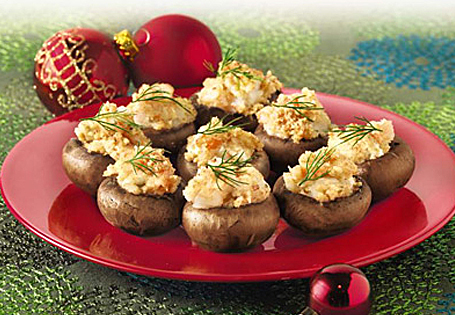 Stuff mushrooms with shrimp mixture and place in prepared baking dish. Bake for 15-20 minutes. Garnish with dill, if desired.